Who's Online: Whos Online enables you to see just like the terminology says who is online. I can see members based on gender and if they have photographs. Find Members: Find members option enables you to search for members based on a few photographs the hottest numbers and newest members and also search options such as gender country zip code age verified photos and what they're seeking. Live Cams: Live cams and enables you to watch live cam shows for a pay per minute fee. Live Chat: Chat with other people on the web site. Extra: Get access to adult videos. Today we are investigating a dating service called NakedLocals.com. The first thing we would like to bring forward is that this site is associated with many dating sites we have exposed for being frauds. The list of sites includes NaughtyCheaters.com, SmashSwipe.com, MilfsMatch.com , CasualMilfs.com , CheatingHousewife.com, and at least another 10 dating sites that we have personally reviewed and investigated for illegal activity. Please read the full review below. It seems that the general public are almost brain dead at this point. Most people simply are not paying attention to what's directly in front of their eyes. Take a look at the screen shot below that was on the homepage of NakedLocals.com, they are telling you that they use computer-generated profiles called "Online Cupids" and they also have a link where you can read what "Online Cupids" are on their terms and conditions page. But somehow still thousands of consumers join Naked Locals and wonder why they got scammed. The reason people get scammed is because they're not paying attention to what's going on! They're living in a Disneyland world where they expect other people to do the thinking for them and somehow things will work out just fine. In the real world you have to fend for yourself and pay attention or you will get ripped off. Understand you need to take responsibility and if you did get scammed using this site you are part of the problem. In order for you to stay safe online you need to know what to be aware of and watch out for. 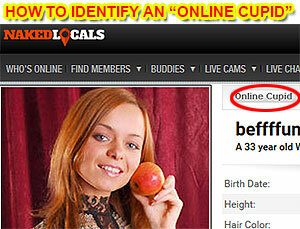 We will show you how to identify fictitious profiles. You can see in the evidence below the words "Online Cupid". This is the website telling you that this is a fictitious profile that they have created. Every single fictitious profile created by the staff of this dating site has the words "Online Cupid" on it. If you're ever wondering if you're interacting with a real person just look for the "Online Cupid" text on the profile page, photo, email message or instant chat message from the person you're interacting with. This will tell you instantly if the person is real or a phony profile. You can take a look at the evidence below and see the words "Online Cupid" circled in red. As we've already mentioned the administrators / owners confess that they create pretend profiles and scatter them throughout this site. This is undisputable, it's a fact. Without these fictitious profiles this website would be like a desert with no female profiles whatsoever. The amount of female profiles on this site would probably be under 3% compared to male profiles. Unfortunately since this website and the people behind it have very little morals they feel justified in creating made up profiles of women to give men who join this site the impression that this website is full of real women. And the real reason they create these profiles is because this is a membership-based dating service which entails that you must purchase a monthly subscription if you want to interact and communicate with other members. You also need to pay for the privilege of interacting with a fake "Online Cupid" profiles. As evidence we have taken a screenshot showing you how prevalent this problem is. When we did a search for girls, every single girl was an "Online Cupid" as you can see from the screenshot we took and have pasted below. The administrators already have outlined that they are behind the false profiles. We started digging even deeper and asking ourselves where exactly are the profile photographs of all these women coming from? Using various software tools we have at our disposal we were able to provide you with more evidence. We have included links showing where the photographs in the fictional profiles are found on other web sites. Below are just a few profiles we decided to add to our evidence, but there could easily be hundreds or thousands of fake profiles using photos that are most likely stolen from other websites used without the permission of the of the owners of the photographs. All the email messages we received were from the faked artificial women aka Online Cupids as well. It's all part of their deceptive marketing strategy of luring gullible men into purchasing a paid membership to communicate with female members. When we tried to read the emails we were automatically sent to an upgrade page where we needed to purchase a paid subscription in order to reply to the emails we received. However, we already knew that the email messages were false and automatically sent from the fictitious profiles that we've already described to you. Unfortunately men joining the site don't have the knowledge that we do and many of them would probably end up taking the bait and get scammed. The same computer bot programs that can automatically send people fake emails are also responsible for deploying and sending fictitious chat messages to the members of the site. You can take a look at the evidence below and you can see an example of a bogus instant message we got. Once again any chat messages we personally received were all sent from Online Cupids and not legitimate female members of the site. All these automated bots are used in an effort to get you to reply back at which time you will have to purchase a paid membership. We should tell you that we did not receive one single message from a legitimate member while we were on this site. To add insult to injury not only does the site use automated computer software robots but Naked Locals even employs real people who are specifically paid to chat with you and other duties. Once again this is a verifiable fact that can be found if you read the terms and conditions page of this website. We have mentioned the terms and conditions page a few times in our review. For the last part of our investigation we would like to include the specific statements made by the administrators of the site that proves what they're doing. In the terms and conditions they admit that they build and use concocted profiles, use automatically generated email and instant chat messages, and they also confess that they hire third-party contractors. In the terms and conditions page they also confess that no physical meeting can ever take place between you and the people running the Online Cupid profiles. This just goes to prove without any doubt what this website is doing is fraudulent, illegal and most likely a criminal act in all jurisdictions of the United States and most likely in all countries across the world. We take our job very seriously, no one else online does the extensive amount of work that we do to expose unscrupulous dating sites like NakedLocals.com. The fictitious profiles, automated bots and all the other techniques they use to bait and hook people into upgrading. Hopefully now you can make the right decision based on all the evidence we have provided for you. How do you cancel I tried calling no answer.